Think of Bangkok and you'll probably picture bustling streets and chaotic scenes. But Thailand's capital is a deeply spiritual city, one filled with Buddhist temples and plenty of ways to unwind, perfect for escaping with a summer holiday sale. Here are a few of our favourites. Unite your body and mind with a yoga class from Bangkok's Iyengar Yoga Studio. Iyengar is a type of yoga that combines precision, alignment and mindful breathing with your asanas for a yoga class that's a little more challenging than the norm. Iyengar Yoga Studio offers beginner and advanced classes, as well as yoga blocks and straps attached to the wall for the super daring. Be sure to check it out between 8am and 8.30pm, Monday to Friday. Get outside and enjoy the sunshine, with an outdoor yoga class in Lumpini Park. A haven of tranquillity in the middle of Bangkok, Lumpini Park boasts leafy trees and a large lake, as well as a multitude of joggers, cyclists and picnickers all enjoying their laidback surroundings. So if you fancy a little yoga alfresco, classes run every day at 7am and again at 6pm on the grassy space under the trees, in between the running path and the lake. Get ready to feel blissful! If you've always wanted to give the practice of meditation a try but haven't really known where to start, then Bangkok could be just the place to give it a go. 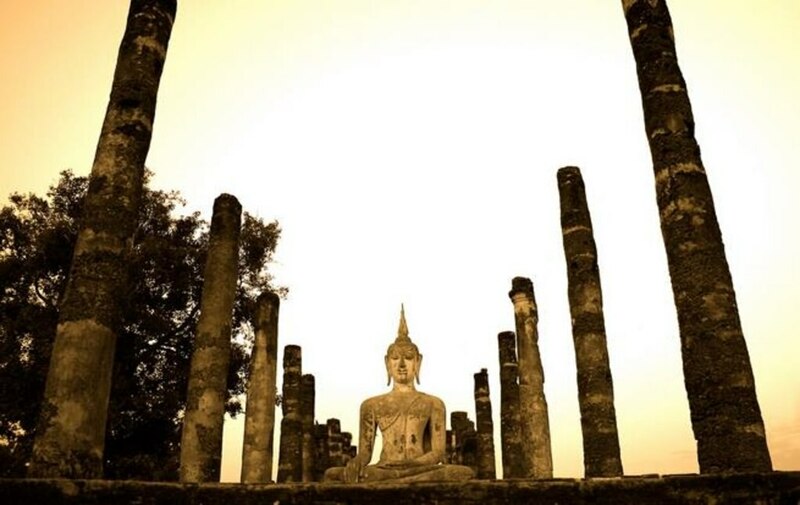 Learn the basic principles with an introduction to meditation course at Wat Mahathat Temple. Here in these tranquil surroundings, you'll begin to quieten the chatter in your mind and begin to be at peace with yourself. The courses are available as half-day or full day sessions. You don't need to be a follower of Buddhism to appreciate the beauty of a Buddhist temple. 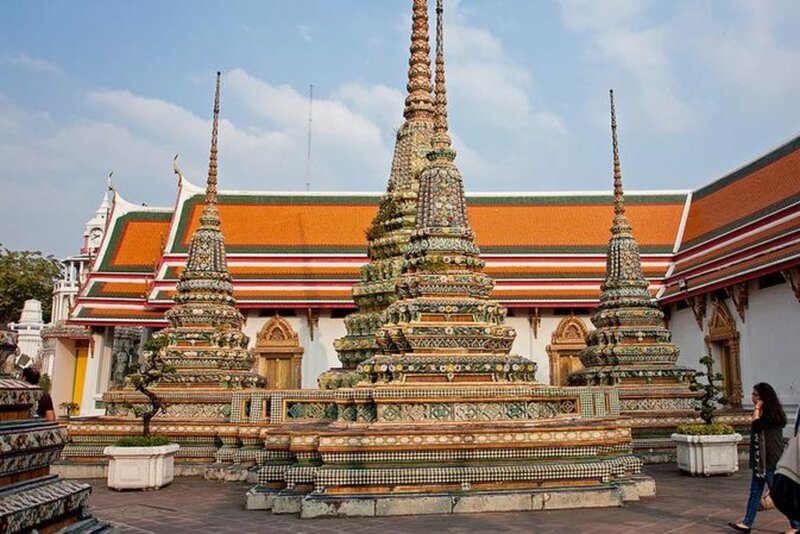 Full of impressive architecture, history and tranquillity, visiting a temple is a wonderful way to spend an afternoon lost in your own thoughts - and Wat Pho is no different. Famous for its giant statue of a 46 metre long reclining Buddha, the atmosphere in Wat Pho is peaceful and hushed - just remember to take off your shoes before you enter! 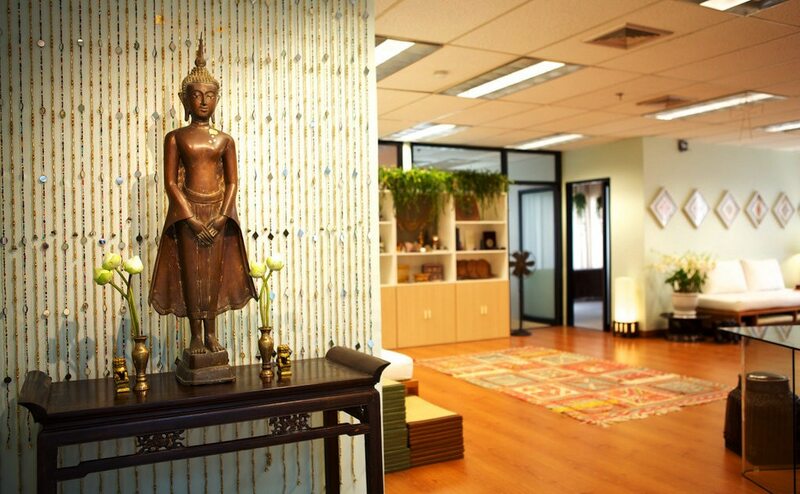 A holistic centre of traditional medicine, Bangkok is a great place to try out some alternative healing or reflexology. Here, there are many centres dedicated to the healing of not just your body but also your spirit and your mind. Describing themselves as 'a cosy little space for those seeking personal growth, well-being, healing, and spirituality', Omroom offers everything from yoga and reiki to tarot card reading and self-empowerment workshops. 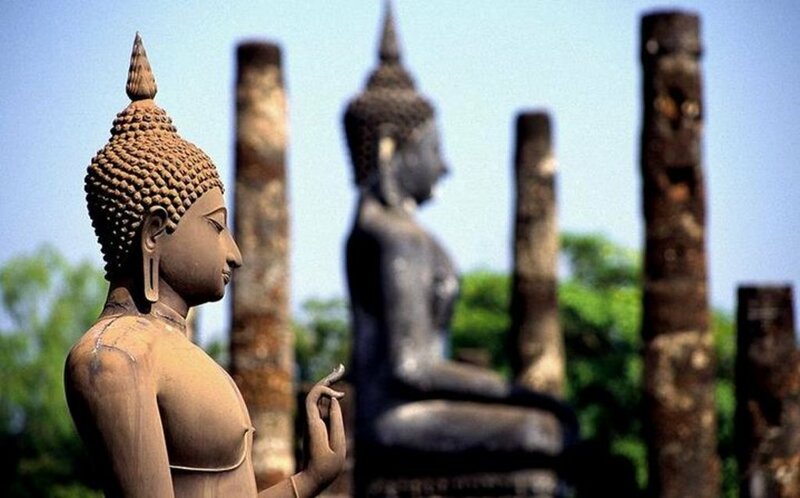 So there you have it, five ways to discover your spiritual side in Bangkok. What's your favourite way to relax? Situated near the airport, this spa hotel is 3.5 mi (5.7 km) from The Paseo Mall and within 12 mi (20 km) of Bangkok Chain Hospital Public Company Limited and Huachiew Chalermprakiet University. Suan Luang Rama IX Park and Khlong Saen Saep are also within 12 mi (20 km). Located in Ramkhamhaeng, this hotel is within 3 mi (5 km) of Bangkok Hospital, Ramkhamhaeng University, and Rajamangala Stadium. W District and Show DC are also within 3 mi (5 km). In Silom Road, this hotel is in the epicenter of shopping and entertainment districts, and in 500 meters (0.3 miles) of Saphan Taksin sky rail station. Approximately 10 km (6 miles) from the Impact Convention Centre and the Muang Ake Golf Course, this hotel is 24 km (15 miles) from downtown Bangkok; complimentary shuttle to the nearest sky train station is available. Our Best Western Premier Amaranth Suvarnabhumi Airport has a total of 278 rooms and suites. The hotel is a seven story property. Its main facility includes an All Day Dining Restaurant, Lobby Lounge Bar, 24 hour room service, banquet and conference rooms, outdoor swimming pool with snack bar, gymnasium, spa treatment rooms, Executive Club floor with private lounge, and both indoor and outdoor parking. The hotel will also operate its own shuttle bus services providing prescheduled journeys to and from Bangkok Suvarnabhumi International Airport. At the Best Western Premier Amaranth Suvarnabhumi Airport Hotel: included in our facilities are, complimentary WIFI access in all our guest rooms and public areas, electronic key cards for additional safety and security, complementary in room tea and coffee making facilities, childcare and baby sitting services, business center, currency exchange. Must book "Krungthep Deluxe Balcony" room category to receive benefits. Full details provided at check-in. Guests must contact the hotel directly to arrange for early check in (standard check-in time is 2 PM); contact information is provided on the booking confirmation email. Taxes and gratuity may not be included. No refunds for any unused portion of offer. Offer subject to availability. Offer is not valid with groups/conventions and may not be combined with other promotional offers. Other restrictions and blackout dates may apply. This family-friendly Bangkok hotel is located in the historical district, within 2 mi (3 km) of Asiatique the River Front, Sri Mariamman Temple, and Saint Louis Hospital. Patpong Night Market and Lumpini Park are also within 3 mi (5 km). This family-friendly Bangkok hotel is located in the entertainment district, within a 15-minute walk of Sri Mariamman Temple and Patpong Night Market. Lumpini Park and MBK Center are also within 2 mi (3 km). This family-friendly Bangkok hotel is located in a shopping district, within a 5-minute walk of Sea Life Bangkok Ocean World and Siam Paragon Mall. Siam Square and MBK Center are also within 10 minutes. Located in Pathumwan, this hotel is within a 15-minute walk of King Power Downtown Complex and Suan Pakkard Palace. Pratunam Market and Siam Square are also within 2 mi (3 km). Strategically located in central Bangkok, the Baiyoke Sky Hotel with its spectacular Bangkok skyline's views, is an 88-storey building a few minutes walk from Sogo Department Store, Siam Square and Siam Paragon . The Baiyoke Sky Hotel is the Thailand’s tallest and the Bangkok’s most scenic hotel, due to its imposing building featuring all services and guest amenities to delight you, from the fine dining venues to the business center and the wellness facilities. Luxury hotel amenities include a coffee shop, restaurant, grill room, lounge bar with music and entertainment programs, Health & Fitness Club with outdoor roof top swimming pool with bar, sauna, gym, massages and beauty salon, souvenir shop, wireless Internet connection, business center, tour service counter, room service and 24-hour reception. Spectacular views over Bangkok and beyond the metropolis, up to the Gulf of Thailand, maps, computerized multimedia kiosks and coin-operated telescopes are available at the Observation Decks on the hotel's 77th floor. Book a stay in any "Serenity Club" or "Suite" room category and receive complimentary free flow of local beers from 10 AM - 8 PM; complimentary canapés at the Club Lounge from 5:30 - 7:30 PM; and complimentary laundering or pressing for up to 2 pieces a day (4 pieces per day for the 2 bedroom suite). Must book a qualifying room to receive benefits. Full details at check-in. Offer subject to availability. Taxes and gratuity may not be included. No refunds for any unused portion of offer. Boardroom use is for a maximum of 8 persons and is subject to availability. Rooms include significant amenities and benefits that are not listed above. Offer is not valid with groups/conventions and may not be combined with other promotional offers. Other restrictions and blackout dates may apply. Located in Bang Rak, this hotel is within a 15-minute walk of Canadian Embassy and Lumpini Park. Patpong Night Market and Siam Paragon Mall are also within 2 mi (3 km). Connected by pedestrian bridge to a Skytrain station, this Bangkok hotel is within 0.5 km (0.3 mi) of Siam Paragon Mall, Pantip Plaza, Siam Square, and CentralWorld Plaza. Two km (one mile) from Queen Sirikit Convention Centre, this hotel is on Sukhumvit Road, known for its lively nightlife. Legacy Suites Bangkok guestrooms include contemporary décor, hardwood floors, DVD players, and well-equipped kitchenettes. The hotel offers an outdoor pool, a rooftop tennis court, and a restaurant that serves Japanese dishes and American breakfast.